The second annual Study in France - Higher Education Fair will be held at the Marina Bay Sands Convention Centre (Begonia Ballroom). Calling all students in Singapore interested in furthering your education overseas, this Fair is For you! 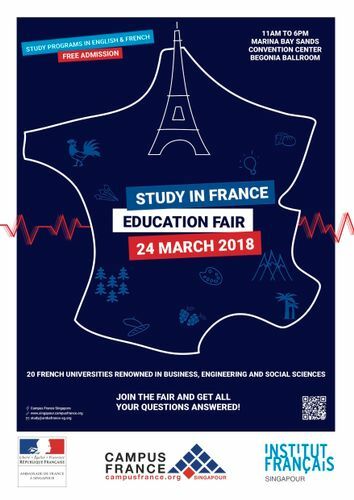 More than 20 renowned French universities and institutions with a focus on Business, Engineering or the Social Sciences will be gathered under one roof. This is the perfect chance to get up close and personal with the universities and institutions you are interested in. Interact with the representatives and get all your questions answered. You don’t need to be fluent in French. These prestigious participating institutions offer many programmes taught in English. Organized by Campus France Singapore and the Embassy of France in Singapore. For more information, please contact: study@ambafrance-sg.org.